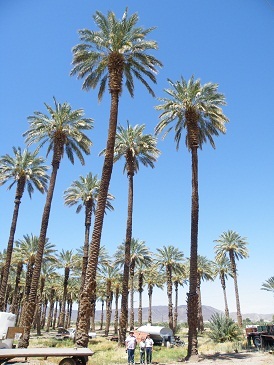 Historically dates have been grown on the valley floor with little altitude above the height of the Colorado River, and indeed sea level. In some date gardens the water table is as close as one metre down. 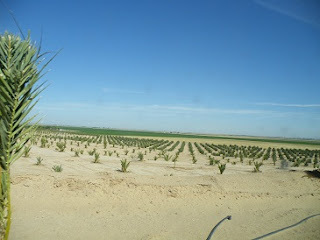 These areas are loamy clay and flood irrigated. 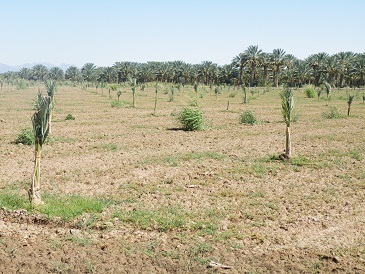 In recent decades date production has expanded onto the mesa which is higher ground surrounding the valley, where land is more available and initially cheaper to purchase. 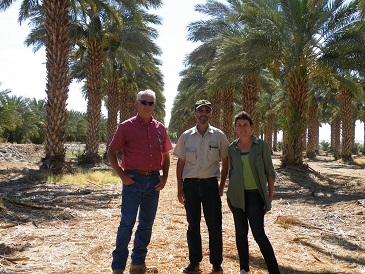 This morning Dave Mansheim, President of the Bard Valley Medjool Date Growers Association took us to the plantation he manages on the mesa. 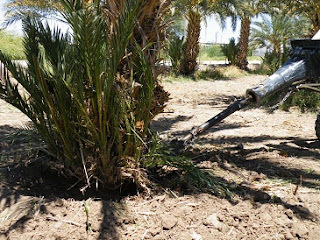 These dates grow on sandier soils which are free draining and typically irrigated via a drip system. 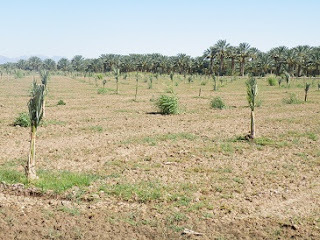 We were interested in seeing how this plantation was established where Dave has levelled land and planted date palms on terraces which have superb views over the valley floor. This concept of landscape terracing lends very nicely to real estate opportunities which may arise should urbanization continue. Dave's management method for dealing with the large volume of date palm prunings was also of great interest - disposing of fronds on-site, leaving in alternate rows. Later a flail shredder passes over the fronds chopping into pieces. 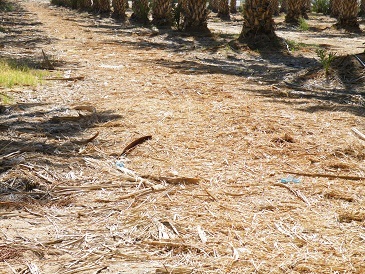 This residue sits ontop of the ground as mulch eventually breaking down. We met with Steve and Ron who also showed us their date gardens and had an opportunity to look at offshoot removal and methods used. 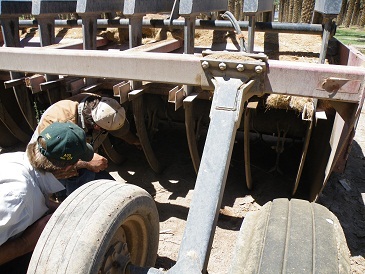 Of particular interest was the sledgehammer chisel attached to a bobcat (skidsteer), used instead of the traditional handheld chisel and hammer. This method ensures workmen can work all day on removal instead of being worn out from swinging a sledgehammer - and we may well adopt for our own offshoot removal. 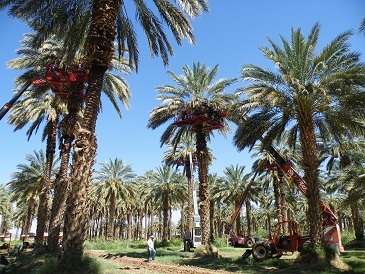 Had a look at plantations Glen is involved in which included mature fruiting palms down to recently established plantations.We looked at freshly planted offshoots and the technique Glen uses to establish new gardens. 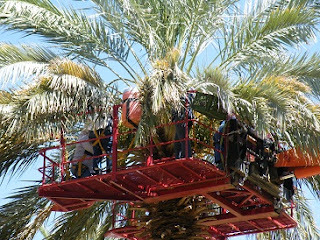 Saw teams of workers completing fruit thinning. We also looked at some Barhee date palms to see their fruit set. Glen was kind enough to show us a tree shaking machine he uses to shake ripened dates from bunches with minimum manual picking; a pollen extracting machine and blowers used to pollinate date palms at flowering. Dinner at Burgers & Beer with members and their wives from the Date Growers Association.